Stock-returns, inflation and the macroeconomy: The long- and short-run dynamics (M. Chopin, M. Zhong). 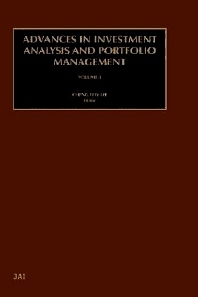 Valuation and hedging of American-style lookback and barrier options (C.C.C San-Lin Chung). The information role of portfolio depository receipts (P. Brockman, Y. Tse). A double sharpe ratio (M. Morey, H. Vinod). Institutional Ownership analyst following and market liquidity (S. Hedge, S. Mangiero). European stock markets: An error correction model analysis (A. Ghosh R. Clayton). Alternative method for robust analysis in event study applications (S.L. Kramer). A test for a new Dynamic CAPM (R. Faff, R. Brooks, T.P. Fan). Biases in Using Jensen's alpha (Y. Xu). Market timing skill, expected returns and mutual fund performance (J. Greene, C. Hodges). Dynamic Hedge with Forecasting: A return-stabilizing approach (C.S Lee). Measuring the interest rate risk of bonds with embedded options (S.V. Mann, P. Ramanlal). Two-factor jump-diffusion interest rate process: An empirical examination in Taiwan money market (S.Yeh, B. Lin). Cross hedging and value at risk: Wholesale electricity forward contracts (C. Woo, I. Horowitz, K Hoang). Using microsoft excel and decision trees to demonstrate the binominal option pricing model (J. Lee). This research annual publication intends to bring together investment analysis and portfolio theory and their implementation to portfolio management. It seeks theoretical and empirical research manuscripts with high quality in the area of investment and portfolio analysis. The contents will consist of original research on: The principles of portfolio management of equities and fixed-income securities. The evaluation of portfolios (or mutual funds) of common stocks, bonds, international assets, and options. The dynamic process of portfolio management. Strategies of international investments and portfolio management. The applications of useful and important analytical techniques such as mathematics, econometrics, statistics, and computers in the field of investment and portfolio management. Theoretical research related to options and futures. In addition, it also contains articles that present and examine new and important accounting, financial, and economic data for managing and evaluating portfolios of risky assets.